Shanghai WER large format roll to roll direct to textile printers have played an instrumental role in leading the analog to digital revolution. 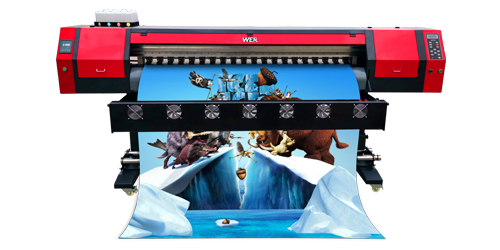 From the instruction of first small size Desktop and Flatbed T-shirt printer to the latest large format roll to roll textile printers, WER printers continue to expand the possibilities of digital print. Today, our integrated system will help your business reach new levels of competitiveness, profitability and growth. 1. Heavy duty roller driving structure, film and durable body, operating with high resolution, and long service life. 3. 4colors (C,M,Y,K) printing with 1440dpi reach perfect printing. 4. The output image is non-fading, water proof and scratch proof. 5. Acceptable Material: Roll Fabric, textile, etc. With our professional direct sublimation printing ink, customers do not need to print product with old-fashioned heat transfer sublimation technology. Which takes too much time and printing cost in the past, all you need is to enjoy the faster speed of our direct printing technology. One key heating system can speed up your printing process, and save labor cost at the same time.